Long before many brands were being advised to think more like media companies, Red Bull was taking its content very seriously. The company has always aggressively created online videos and sites that are intended to embody the adventurous, energy-filled lifestyle the brand represents -- and not always to sell products. In fact, several years ago, Red Bull formed its own independent content and production company -- Red Bull Media House, which acts and operates like any traditional media company. 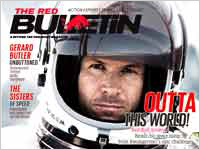 It also offers its own iPad magazine in the free and lushly tricked-out Red Bulletin. We asked the company’s Managing Director Werner Brell how he measures the value of branded content. Q: How has your app been received by consumers so far? A: The consumer feedback to the app has been very positive. Our average star rating is a 4, and the comments have been glowing. There’s a sense that we’re approaching a content-based magazine-style app with a respect and enthusiasm for the platform’s potential. The iPad didn’t simply make magazines digital, it gave the medium a new lens on its content. Red Bull Media House, like the core brand, gives wings to people and ideas. We believe our iPad is that for our magazine content. Q: What’s the value of branded media on the tablet platform? A: The value of branded media is several-fold. For starters, Red Bull has created compelling content from hundreds of sports and culture events and athlete projects globally for nearly 25 years. From the beginning, Red Bull has filmed, photographed and provided high-quality stories for broadcast, print and digital media partners. In 2007, Red Bull formalized this content production, collection and distribution process and launched its biggest line extension: Red Bull Media House -- an Emmy Award-winning global media company headquartered in Salzburg, Austria and with a North American base extended to Santa Monica, Calif. in January 2011. Red Bull content is optimized for any device. Q: What is the revenue model? A: Red Bull Media House generates revenue from its owned media platforms, such as The Red Bulletin magazine (1.2 million circulation in the U.S.), "The Art of FLIGHT," an epic snowboarding film that debuted as the #1-selling movie on iTunes, and by being one of YouTube's inaugural Action Sports content producers. The iPad gives us a portable window into that content pool in a way unlike the Web or even TV. We intend to grow our footprint in the tablet space, as you’d expect. From a marketing standpoint, branded media seamlessly sits alongside non-branded entertainment from our playgrounds. We don’t distinguish the two, and we feel that enhances the authenticity of our stakehold in the space. This is a platform our audience gravitates to, through the sharing of compelling programming. Q: How do you measure ROI for such a project? A: Measuring ROI for our brand as a whole revolves around creating affinity within our core consumer segments. With the iPad being such a new channel for our content, we’re still observing the results. But we’re committed to the platform, and feel confident that in time, we’ll be able to paint a dotted line between brand loyalty and the premium content we’re sharing via iPad. Q: How does your app fit in with RBMH’s overall mobile strategy? A: As a media company, Red Bull Media House is driven to create compelling products across all content platforms, and to be optimized for any device. With the iPad’s growing place in video, periodical and gaming entertainment, it aligns with so much of what we’re focused on. We already have numerous mobile apps in the Apple marketplace, and want to continue growing our tablet offerings over the coming years.